Valentine’s Day is just a few weeks away, so Karyn of Pint Sized Baker and I teamed up to bring you some super cute ideas! At first glance, this lil’ lady might seem like a lot of work, but fear not… it’s easy to assemble in a few simple steps! 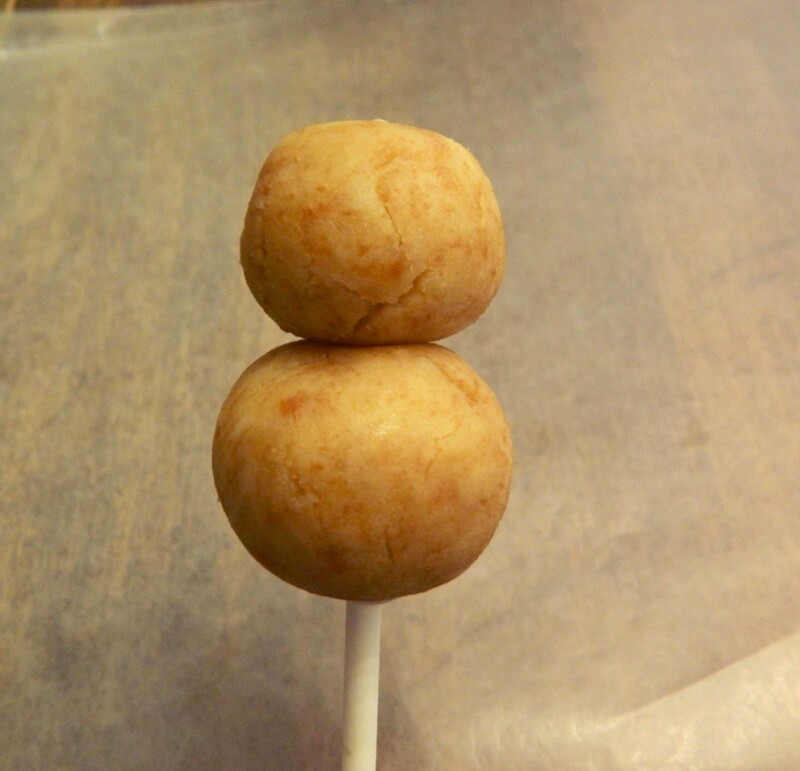 For her body, place two cake balls on a stick, with the top one being slightly smaller than the bottom one. Cut a section of shoestring licorice where it bends like a “U”, and slice it in the middle of the curve. This will give the antennas a natural curve at the tips. Dip the curved tips into melted chocolate, then disco dust… ooh la la! 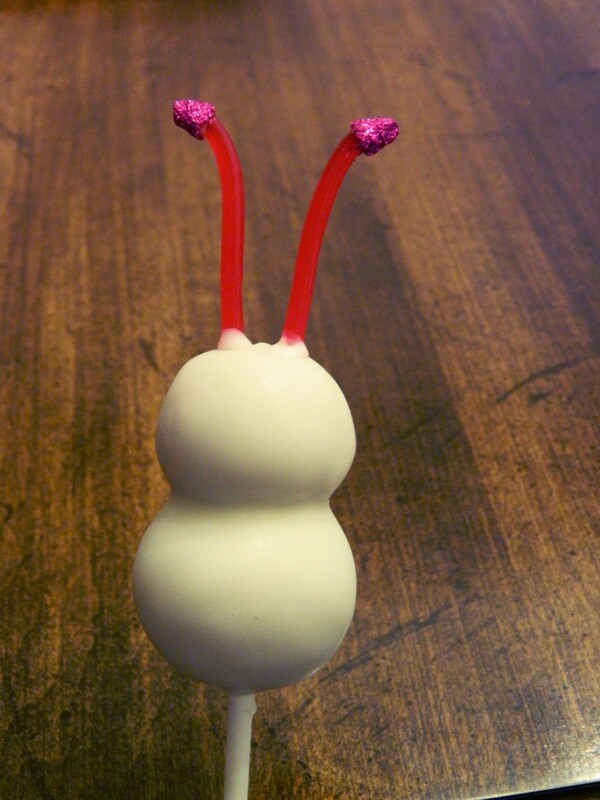 To attach the antennas to the bug’s head, dip the other ends into melted chocolate, and hold them in place for 10-20 seconds until the chocolate sets… see it taking form? I found these mini heart molds at AC Moore; they’re about the size of a quarter. Fill the wells with melted candy and put it in the refrigerator; after about 5 minutes, the hearts pop out easy-peezy. 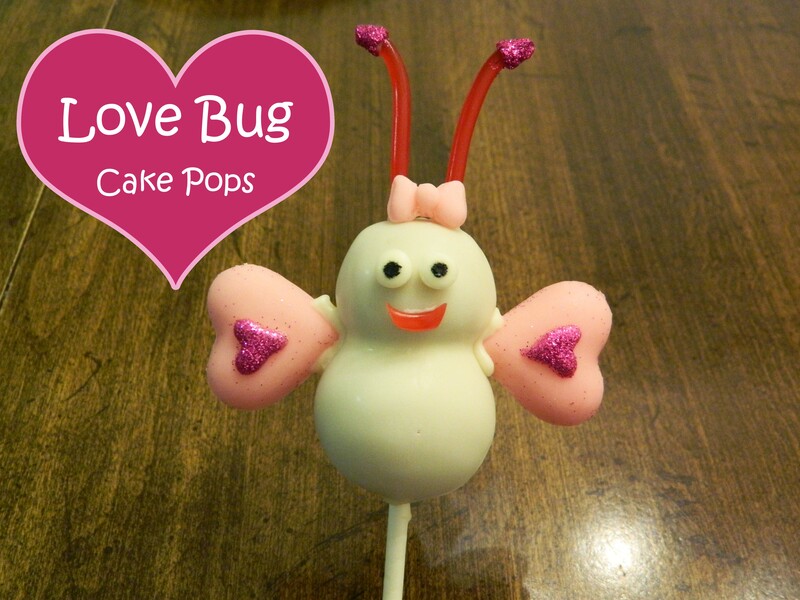 Pipe mini hearts onto the wings with this neat technique from Heavenly Cake Pops. Quickly sprinkle on disco dust before the chocolate dries, and allow it to harden. Then, using a dry brush, sweep off the excess sparkles. (I wasn’t able to get all of it off, but I think a few flakes left behind gives it a nice look anyhoo). 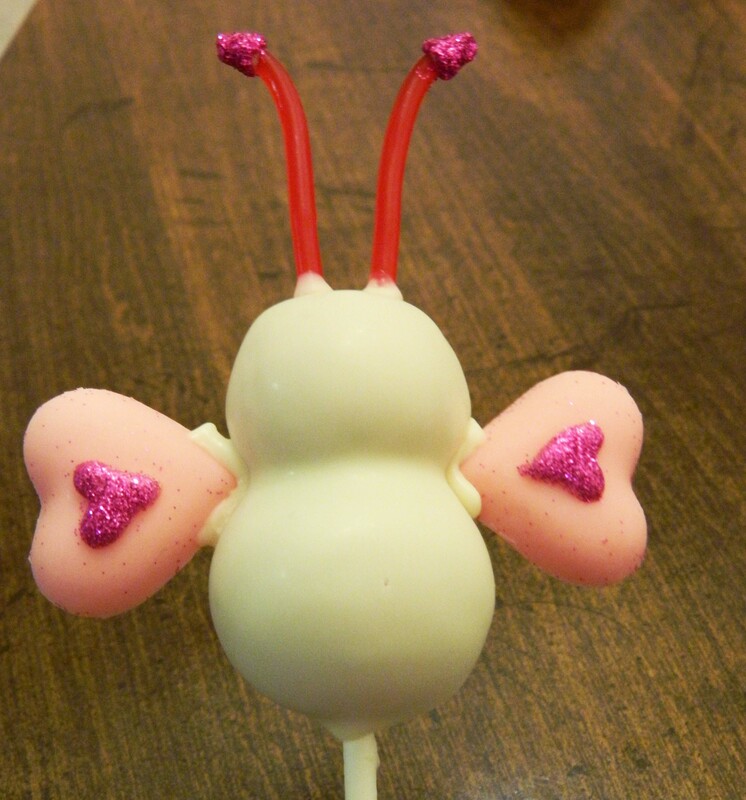 To attach the wings, pipe a thin line of melted chocolate around the “V” of the heart, and attach it to the bug body. (I went a little too heavy on the piping, you don’t need that much… also, use the same color chocolate you used for the actual wings, it will blend in better… gotta’ love hindsight!). Just like the antennas, you will need to hold the wings in place for 10-20 seconds until the chocolate sets. I found it easiest to rest the heart across my finger tips to let the chocolate dry – this helped to keep them even. Now, see the white chocolate marks on the ends of the antennas? 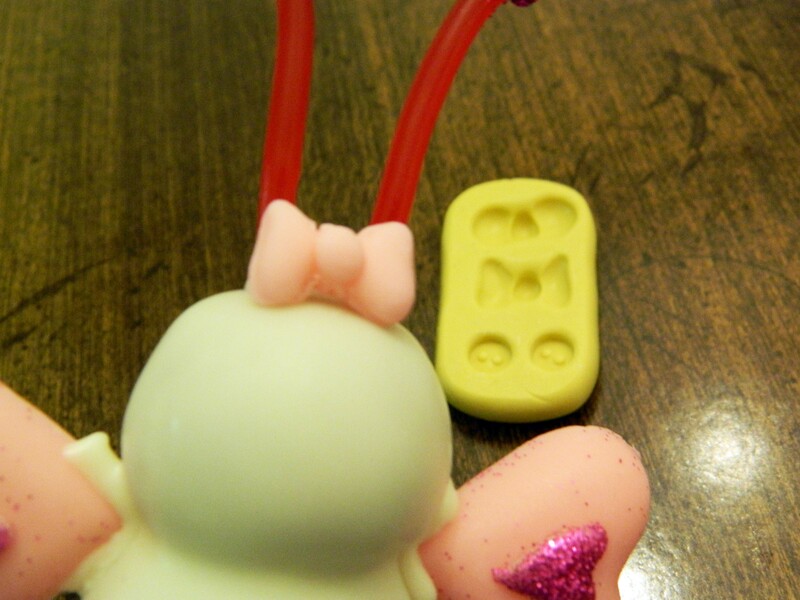 For some reason, it was bugging me, so I made little bow with this AWESOME mold I got from Lollicakes By Ella! It’s made from silicone, and bends back easily so you can take your shape out… so cool. For Miss Bug’s face, there are lots of options. You can buy pre-made candy eyes, or draw your own face with edible-ink pens. I made my own eyes with white candy & drew on the black dots. Her little smile is a thin slice of shoestring licorice. Be sure to check out Pint Sized Baker’s post for even more lovey inspiration! Thank you! (and I haven’t eaten it yet, haha! Its still on display in my cake pop stand on my counter). So, so cute! I would never be able to do this!! I would love if you would share this at Iron Chef Mom -White Chocolate!